Kalokairi, the island in the first "Mamma Mia" movie starring Meryl Streep and Amanda Seyfried, is really the island named Skopelos. The island is in the Aegean Sea off the coast of mainland Greece. Skopelos is part of the Sporades island group of Greece. Kalokairi is a made-up island name used in the first "Mamma Mia" movie and has nothing to do with Skopelos itself. In Greek, Kalokairi means "summer," so just about any Greek island could be called a "summer island." For more information on the "Mamma Mia" movie locations, including where some of the stars lived and dined on Skopelos, check out Mamma Mia Movie Locations. For the Mama Mia 2 version, the film crew moved to Croatia so you may want to consider the island of Vis in Croatia as your destination. 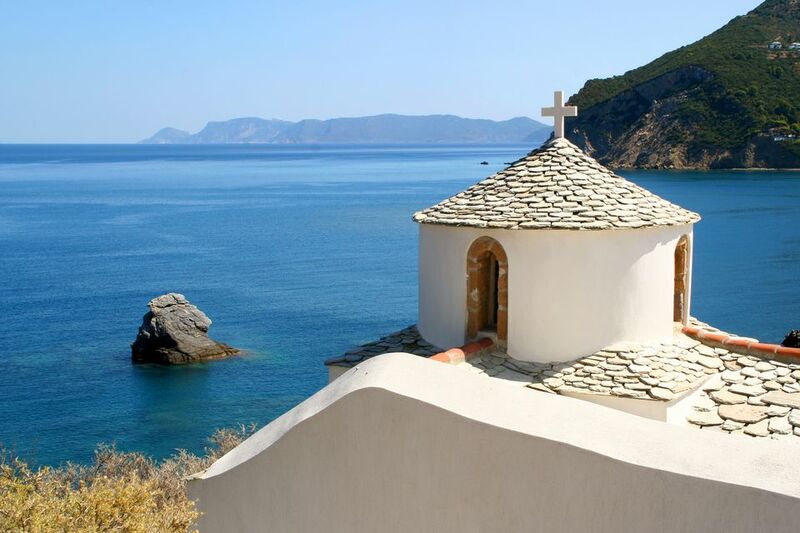 Even if you don't love "Mamma Mia," Skopelos is a relatively unspoiled island catering to British and Greek tourists. It's considered an expensive island by Greek standards, definitely not catering to the backpacker crowd. Since the first "Mamma Mia" movie, the island has seen a bit of a surge in tourism. Before it "became" Kalokairi, it was a favorite island for Greeks to visit for vacations. There are many small hotels on Skopelos, and you can also rent villas or apartments. Food on Skopelos tends to feature plenty of fresh seafood traditionally prepared, but chicken pie is also popular. Don't expect it to be quite what you would get back in the states, however. On islands, it's hard to abandon the idea of eating fresh fish along the quay. Seafood restaurants dominate TripAdvisor listings along with Italian food and bakeries for coffee and breakfast. The patron saint of Skopelos, Agios Reginos, has a feast day on February 25. The Loizia Festival in August is a popular cultural event, with concerts, the music of Loizos, theater, dance, storytelling, food and more. In the past, Skopelos has also held a photographic exhibit in July; the Prune Festival in August; and a free, September wine event in the town of Glossa. During the Wine Festival, organized by the Cultural Society of Glossa, visitors are offered free wine. The celebrating and the dancing lasts till the early hours of the morning. Another annual event, the International Film Festival for Youth, takes place in summer in the town of Skopelos and features cinema workshops and film screenings. Skopelos has no airport, so visitors need to fly to Skiathos, where some other scenes in the original "Mamma Mia" were shot, and then take about an hour-long ferry ride to Skopelos. That's the quickest route. You can also drive up the coast from Athens on the fast, good National Highway. Or cruise down the coast from Thessaloniki and then take a ferry to Skiathos from Agios Constatinos, and then go on to Skopelos. There are other ferry options available, especially in summer. Where's Mamma Mia's Villa Donna in Greece?